Example 11 N. Main St.
Alexander Jackson Davis & Andrew Jackson Downing, designers & promoters of Gothic Revival style architecture also saw picturesque possibilities in Italy, especially the northern or Tuscan region of Italy. The most elaborate examples of the Italian Revival style sought to imitate the beauty of country villas. Plans were asymmetrical; square shapes with towers; balconies; low-pitched gable or hip roofs supported by brackets; porches; verandas; & round arched windows & window hoods. Colors like those of the Gothic Revival style came from those found in the landscape. 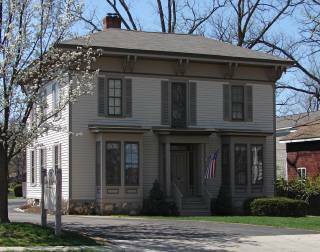 Simple examples, like those of Michigan farmhouses, were 2 story squares with low-pitched hip roofs with deep bracketed eaves, & a veranda/porch surrounding the house. Italian ate is usually the name given to commercial buildings built in the Italian Revival style, often employing blind round headed arches carried on engaged brackets, round arch window tops & hoods & bracket to support a heavy cornice at the eaves of the roof.